While it seems winter is bearing down on the Northern Hemisphere, things are looking up here in South Florida. The oppressive heat is abating and I have been madly renovating my screen porch furniture in preparation for our gardening season. All new cushion covers and some new (to me) vintage Rattan furniture for lounging. Temperatures are hovering in the 80’s (Fahrenheit, Centigrade confounds me) so it is becoming very pleasant. 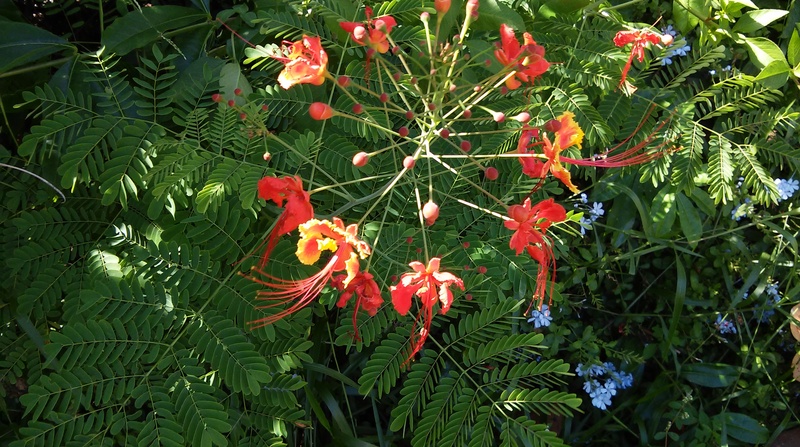 These trees are smaller than but similar to the Royal Poinciana, and varieties are available with yellow and coral flowers as well as the red mixed which is most commonly seen. 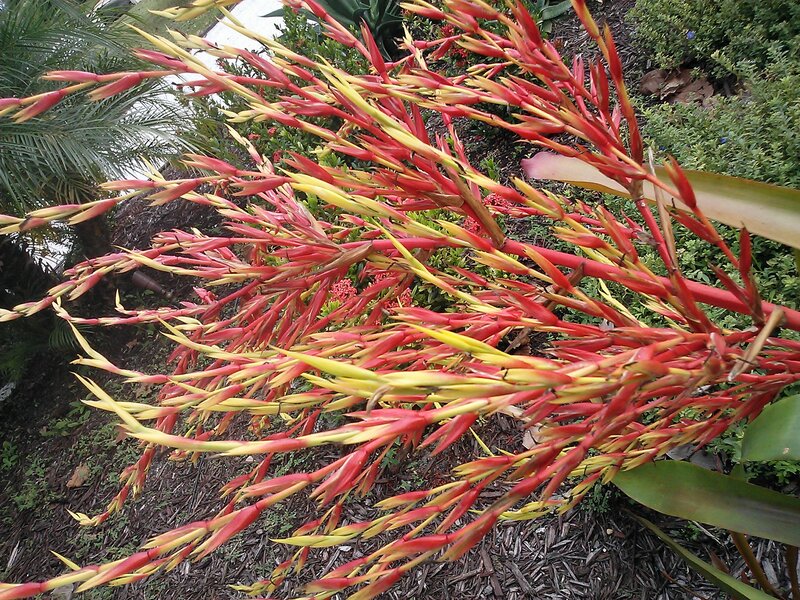 Other things I am now considering fall color are certain Bromeliad flowers (Aechmea blanchetiana) and Bird of Paradise. The tropical Golden Rain Tree (Koelrueteria bipinnatus) is just starting to flower here. In December the pods on the Raintree give us a little more Autumnal feeling. Tropic Florida does have some more typical fall fruiting plants. 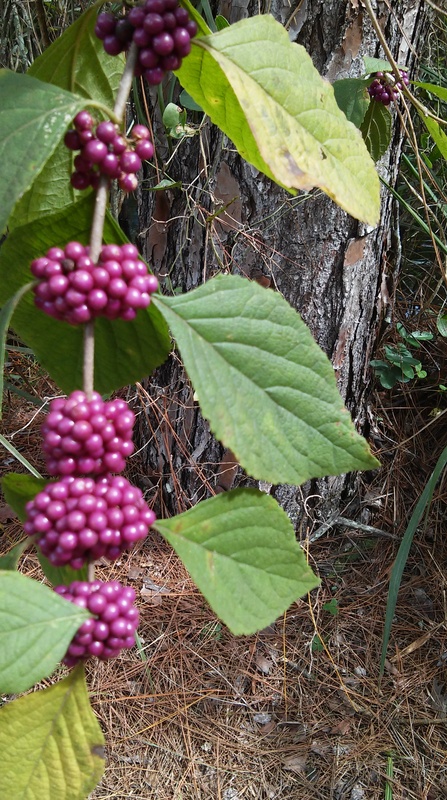 The Beautyberry, Callicarpa americana, native to a large part of the Eastern United States is common here as well. 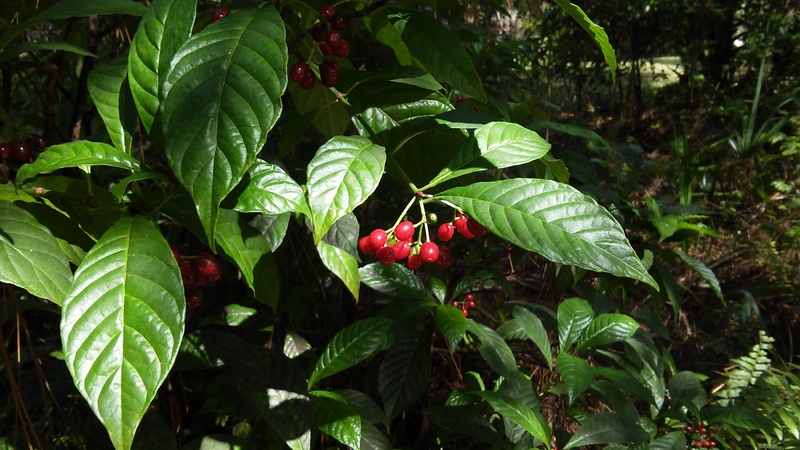 The red berries are from our native shrub, Wild Coffee, Psychotria nervosa. I have seen Beautyberry Jelly but never consumed any and supposedly the Wild Coffee has psychedelic effects so coffee brewed with something other than the Wild Coffee berries is a better idea. Blueberry Scones and Starbucks coffee are more in my line of thinking for breakfast fare. I know that if I wait long enough, I will spy a Red Maple with some dull purple Fall color, usually in December and in a swamp somewhere. But with all these other Fall beauties I am not missing the Maples – Much.